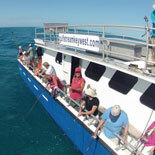 The entire family can enjoy an excursion on the Gulfstream IV, Key West's leading nighttime deep sea fishing tour. The licensed and gregarious mates and captains are ready to help novice anglers and experienced professionals make the most of this nighttime fishing experience. 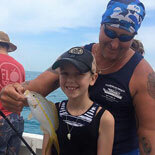 Highlights of this expedition include a fish finder, complimentary license, bait, tackle and rod and an available food and beverage service that include children's fare. The Coast Guard-inspected vessel features an enclosed cabin with cushioned seating as well as male and female restrooms. Our Motto: Catch Fish-Make Customers Happy! To avoid the daytime heat of a summer, many professional anglers fish at night. (It also eliminates the need for messy sunscreen.) Another important advantage is that fish are often more active after the sun has gone down. The overall experience is more comfortable and provides a better opportunity to catch more fish. 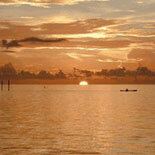 A Gulfstream Party Boat Fishing Night Trip is a fantastic way to experience nighttime fishing off Key West. Once at the offshore reef, you can test your strategy against amberjack, grouper, mackerel and snapper as well as tuna and swordfish. 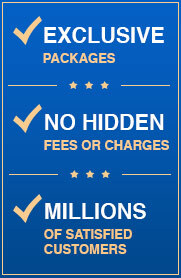 Come see why Gulfstream IV has been Key West's premiere party boat for more than 60 years. A party boat is a less expensive way to experience the thrill of deep-sea fishing the stunning waters off the Florida Keys. Also known as drift fishing, this group excursion takes place aboard the 58-foot-long Gulfstream IV, a Coast Guard inspected boat that features an air-conditioned cabin, comfortable seating and restrooms in addition to a snack bar. All you need to bring is your game-winning strategy because all the required equipment is provided along with a complimentary fishing license. The accommodating captain and crew are glad to help novice and experienced anglers bait their hook and reel in a prize catch. Fish cleaning is available, and you are permitted to bring along your coolers. 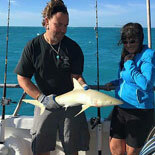 The crew will help you celebrate your trip by taking your picture with your prize catch. 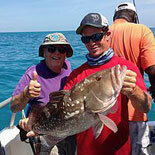 Make your reservation today to fish beneath the stars on the next Gulfstream Party Boat Fishing Night Trip Tour. The Gulfstream gets the fish you want! Wednesday, Friday & Saturday 7 pm - 12:30 am from June 15- August 31. Please arrive at 6:30 pm. N Roosevelt Blvd. and Palm Ave. Parking available free at the Marina. 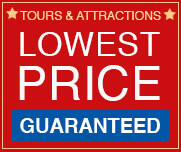 To cancel for full refund you must cancel 24 hours in advance.